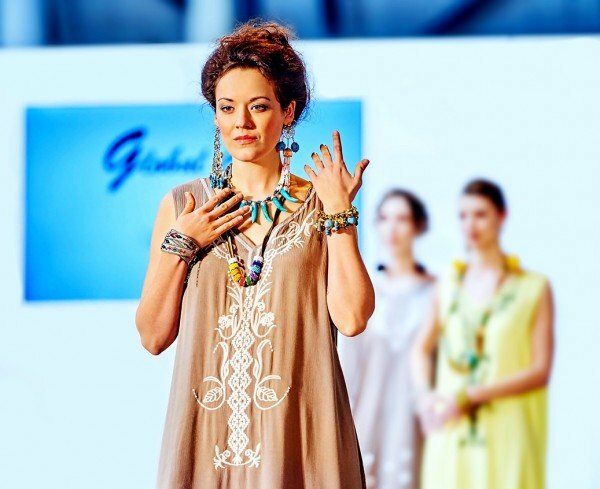 Our Global Chic product line was beautifully captured in this picture from the “Creativity on the Catwalk” fashion shows in the UK last month at CHSI Stitches. One of the looks he styled features a spectacular necklace which also appear in the latest Perles et Cetera magazine as a step by step. 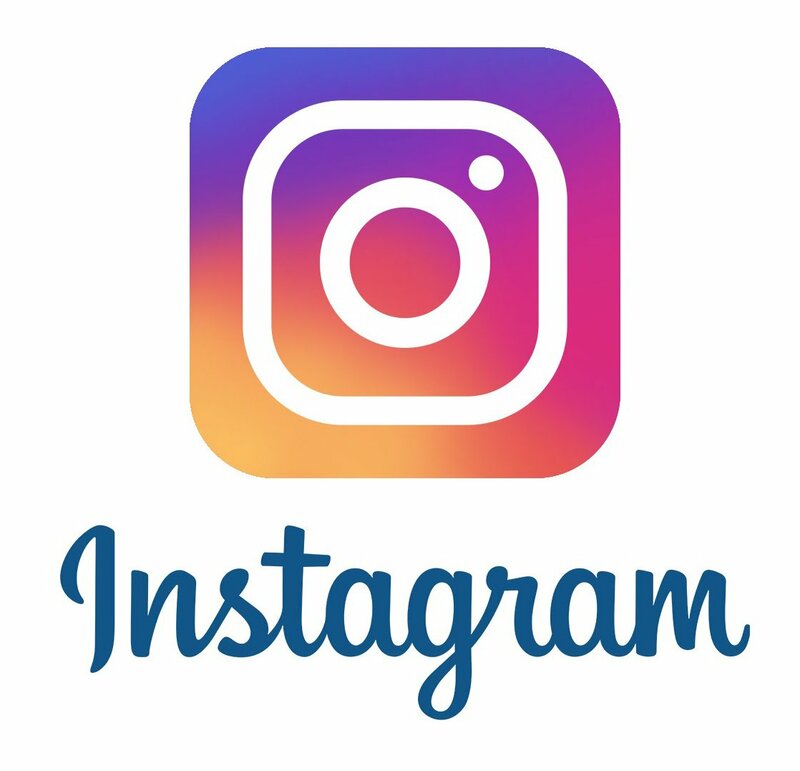 The english translation is provided in this post. 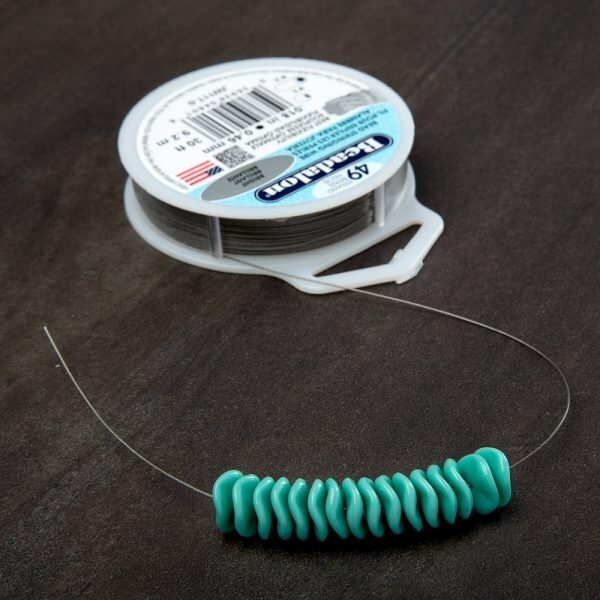 In 2015, PRECIOSA ORNELA introduced a new pressed bead known as the PRECIOSA Ripple™. 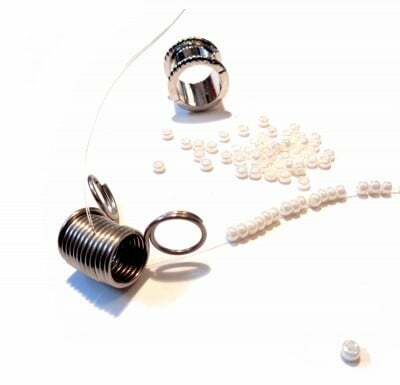 The circular bead has a centrally located hole and the undulating surface of the bead causes a ripple to pass through the metallic decoration in both the shiny and matt finish. 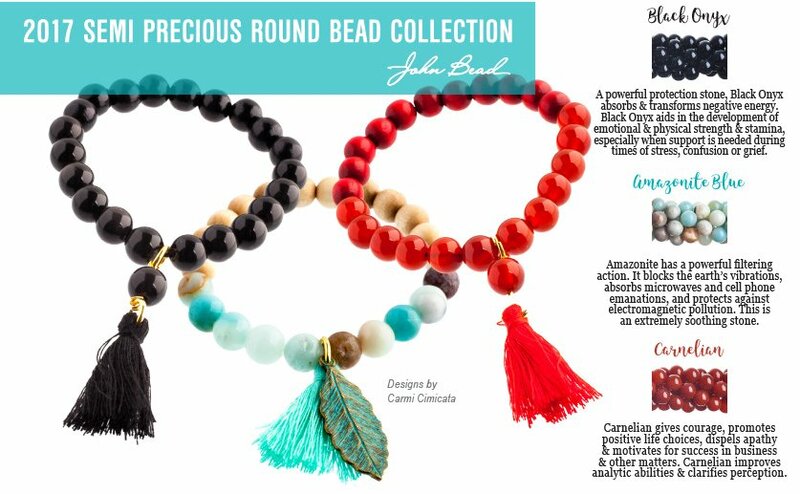 Designers around the world are combining the Ripple™ with other beads and discovering that it can also be strung and showcased in a number of unique ways. 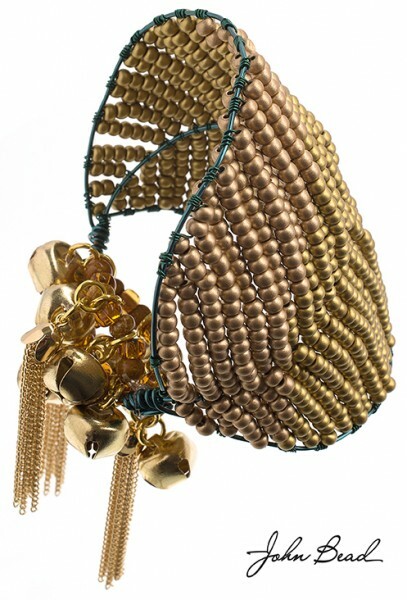 Fernando chose to recreate the look of an African necklace usually made with horn discs. 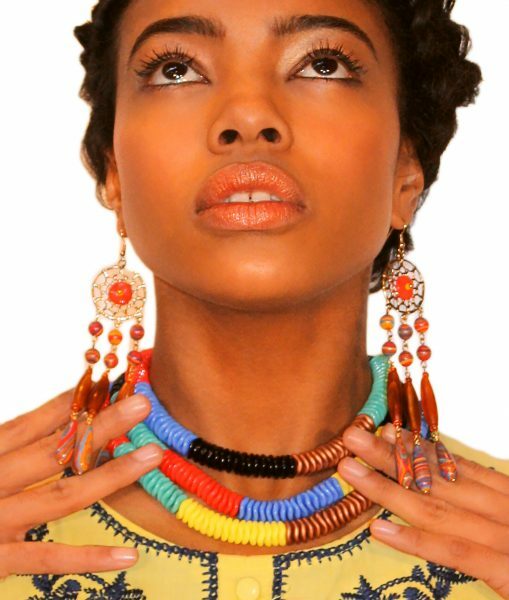 These African bead necklaces are called Laguidibá and are usually in black or brown. Fernando created his own version of this distinct style by stacking Ripple™ beads colours in blocks. 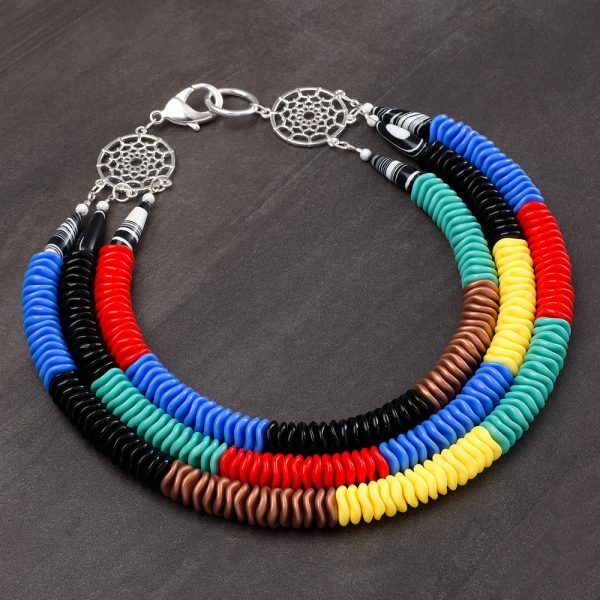 Recreating this tiered necklace and customizing it to your own colour pallet is not difficult if you follow a few simple jewelry-making steps. 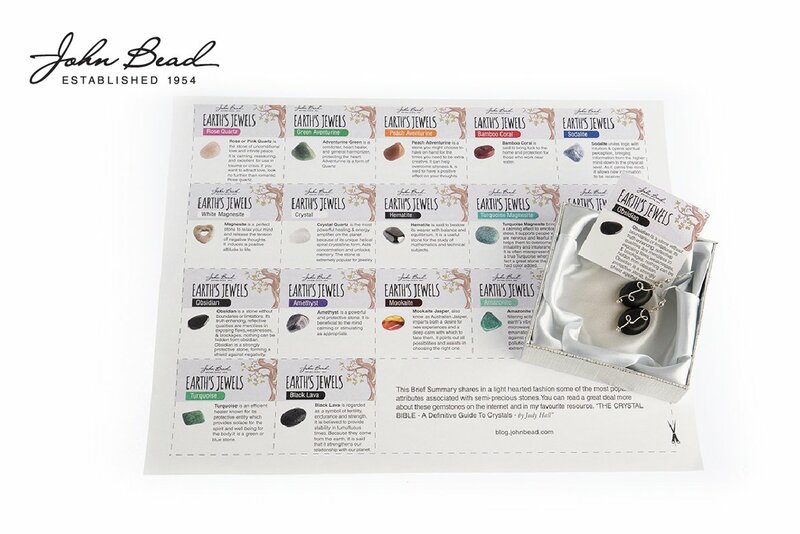 Select your Ripple™ beads and divide your strands into small piles of sixteen beads. 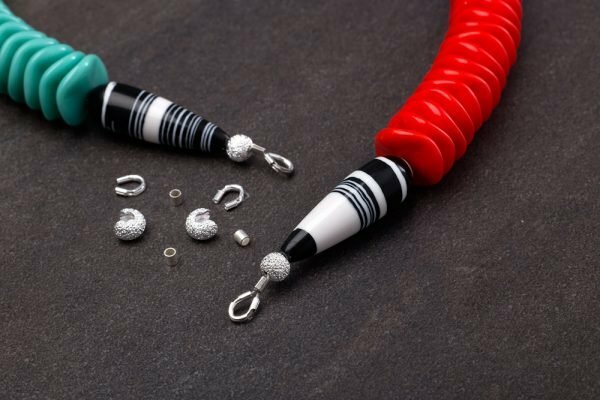 A unique Global Chic teardrop bead was added to both ends of the strands before finishing with a wire guardian and crimp bead. 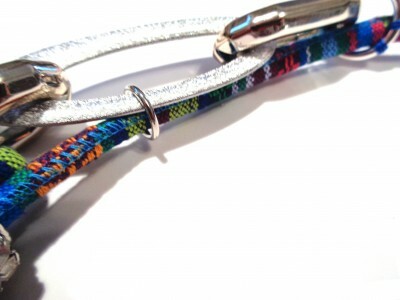 Fernando used two crimp beads to ensure his beads were securely strung. 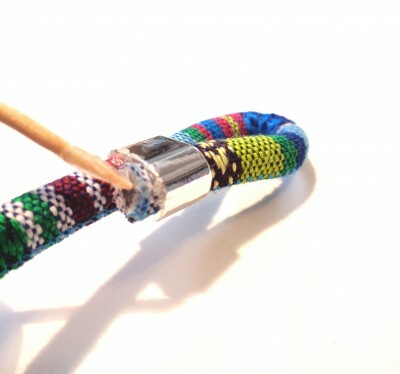 The three strands were then attached with a jump ring to the dream catcher connector. The placement of the strands is important to ensure you have the tiered effect. Also, he thought the dream catcher component would be perfect for matching earrings. A clasp is your last step. If you would like to wear the necklace slightly longer or simply make it fit better, a necklace extender will finish the necklace so that anyone can wear it. 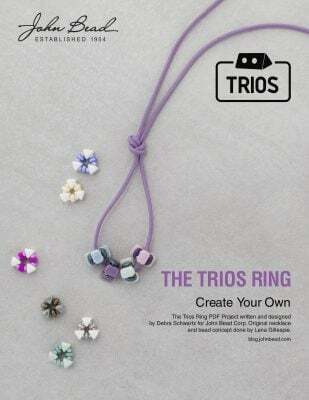 Ripple™ beads also work beautifully on elastic cording. 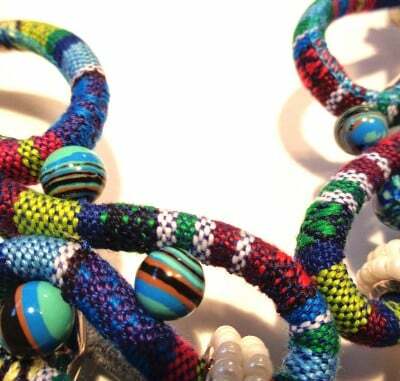 Leftover beads can be easily sorted for matching bracelets. 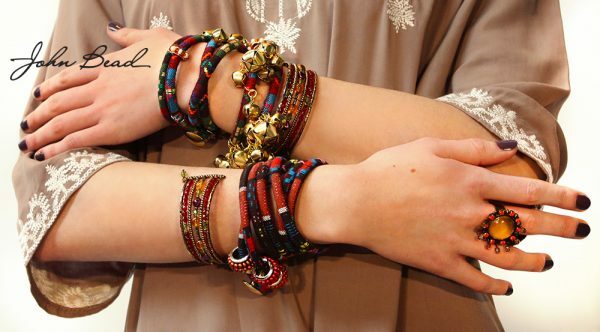 The ethnic chic look can be achieved with the addition of matched and stacked bracelets. The bracelets and the necklace are completely on trend this summer. 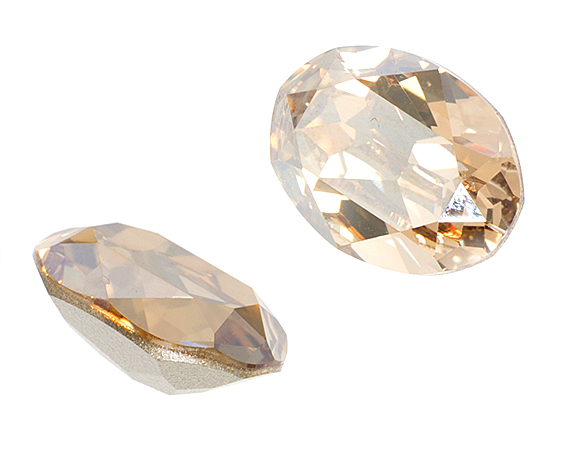 The earrings for this look are also showstoppers. Fernando continued “I really wanted big earrings so I created a vintage inspired chandelier earring set with semi precious drops and beads. 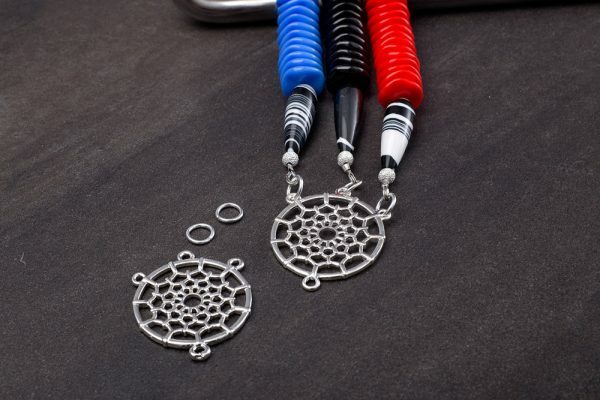 The beads have been added to filigree earrings hand set with more ripple beads. Look One – Golden Butterscotch can be viewed here. Look Two – Wild Boho can be reviewed here. The unique embroidered dresses were hand picked by Fernando in Brazil in January. Here is a closer look at just one of the six models he styled. 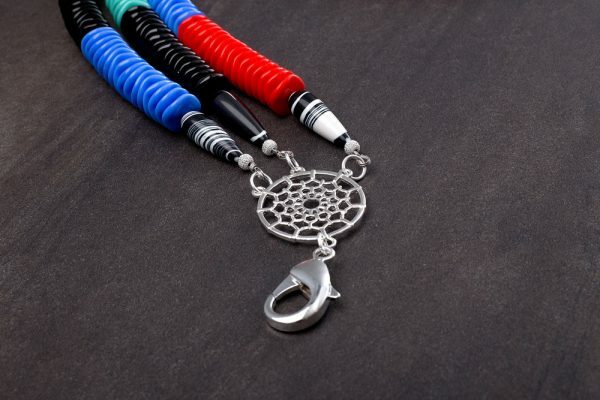 A long necklace featuring a wired flower by Lena Gillespie of Purple Lace Designs designed to almost blend with the embroidering lines of the navy blue kaftan. Lena’s wire and beaded flowers uses our Tropical Punch flower maker as the centre. You can see more of them in an earlier blog post linked here. 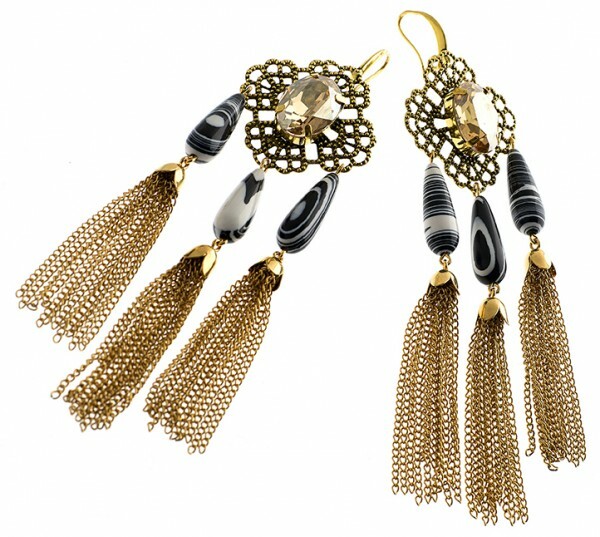 They beads have been added to filigree earrings hand set with crystal stones and chain tassels. 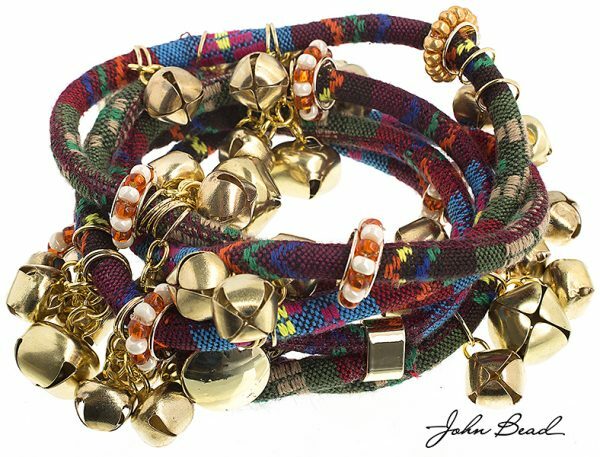 The bracelets were used in their natural state – just plain blank brass cuffs, but one of them was paired with the beaded charm bracelet. 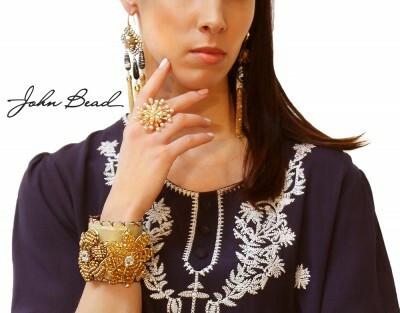 The ring you see is a finished item in our John Bead Outlet. 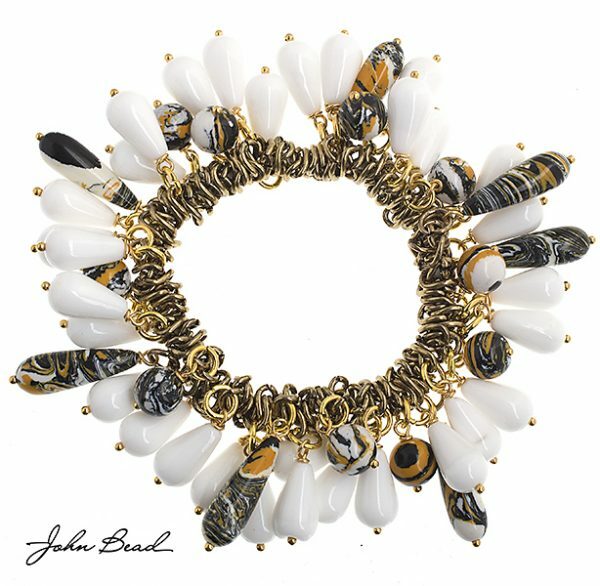 Global Chic semi-precious bead drops were combined with white opaque glass beads for this spectacular bracelet. 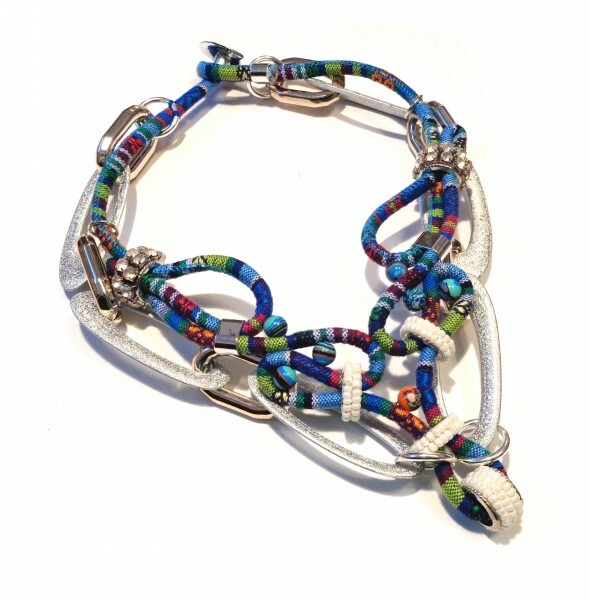 Each bead was individually attached to a finished chain link bracelet. This is post five in our series from the Creativity on The Catwalk show. Our Global Chic product line was beautifully captured in this picture from the “Creativity on the Catwalk” fashion shows in the UK last month at CHSI Stitches. (Photo from CHSI) Our Creative Director, Fernando DaSilva designed an “out of the ordinary collection of jewelry that is delightfully different, chic and of course trendsetting.” Here is a closer look at just one of the six models he styled. The unique embroidered dresses were hand picked by Fernando in Brazil in January. Fernando has some global inspiration for this look. The goal of this look was to showcase the tapestry cords from Global Chic collection and our model Sophie Kelman does that spectacularly with her completely adorned arms. Fernando used 5 ft of tapestry cord for each design. 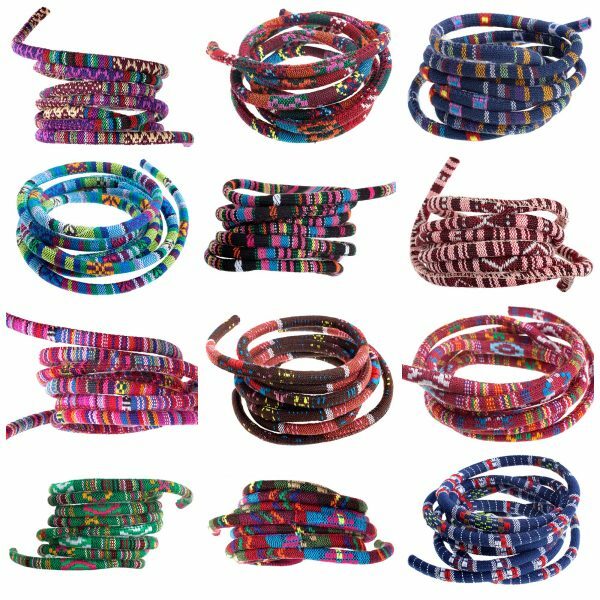 We have tapestry cords in a grand selection of colors. Creating a color palette is only difficult due to the many options available. The pom-pom earrings were added to bring a sense of joy to this look. 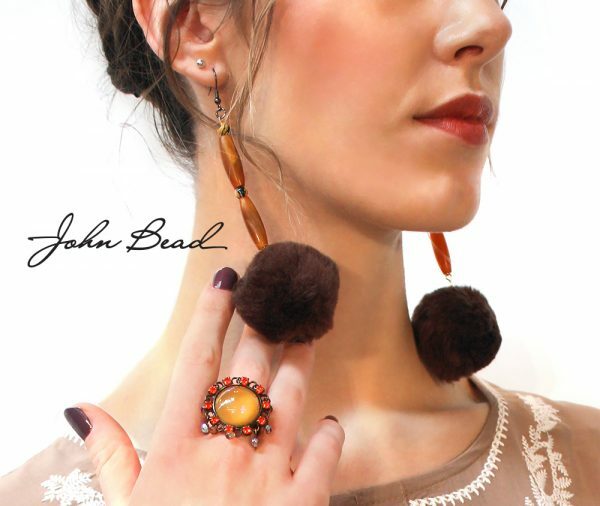 Pom Poms are something we have had in the John Bead catalog for decades. 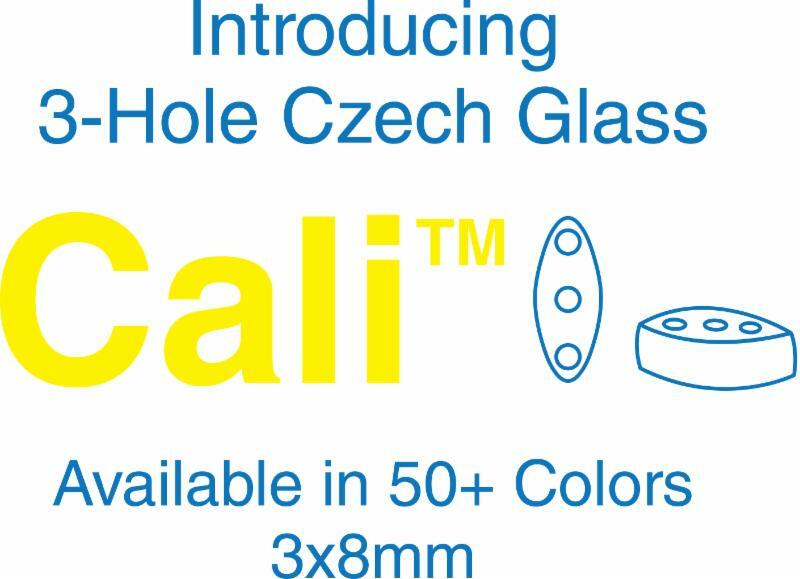 They are available in many sizes and colors too. The bells are also fun to work with. 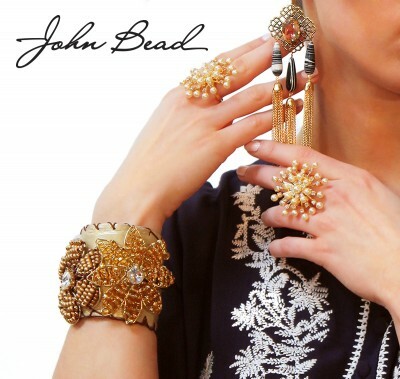 The rings our model wore are from a collection of already finished European jewelry we sell in our John Bead Outlet. 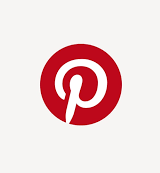 This is post four in our series. 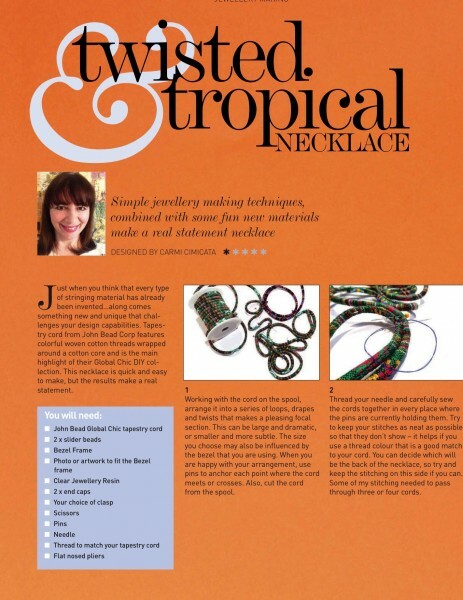 The current issue of Bead and Jewellery Magazine in the UK did a wonderful job featuring our twisted and tropical necklace submission. 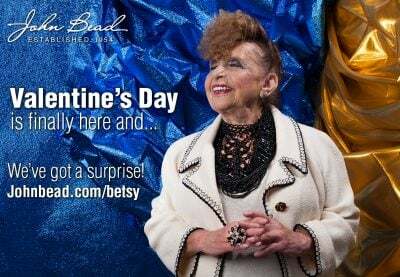 Our Creative Director, Fernando DaSilva designed an “out of the ordinary collection of jewelry that is delightfully different, chic and of course trendsetting.” Here is a closer look at just one of the six models he styled. The unique embroidered dresses were hand picked by Fernando in Brazil in January. 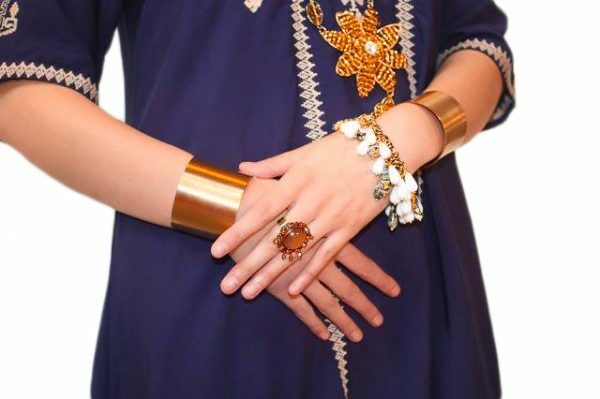 Fernando combined a traditional caftan with one of a kind art jewelry. Sandra Baumgartena is the perfect model for this look because she radiates confidence. The look implies that she loves drama and texture and Fernando believed if she walked into Diane von Fürstenberg’s office she’d be hired in a moment! Sandra’s cuff prominently features wire and beaded flowers hand crafted by Lena Gillespie of Purple Lace Designs. Her beautiful wirework uses our Tropical Punch flower maker as the centre. Fernando used our leather sheets to wrap a brass cuff with hand stitched edging and a faux suede lining. Lovely knots chocolate cord was used for the stitching. Leather strips are riveted in place to attach the flowers using the rings already soldered to the back of the flower maker. 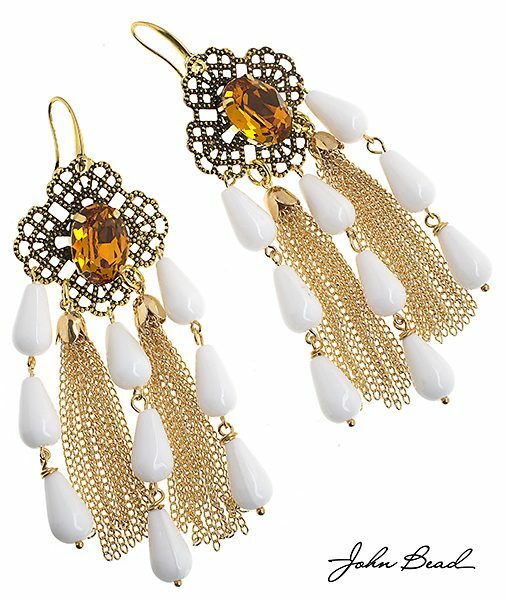 The earring are also show stoppers. Filigree is set with a Swarovski crystal stone. 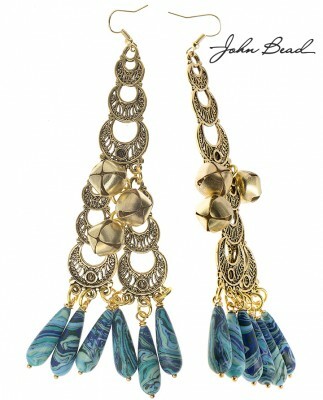 Global Chic semi precious teardrop beads and gold chain tassels create the dramatic dangles. These earrings could easily be turned into pendants as well. The Global Jet-Setter look was completed with the addition of these Czech rings which were already handmade and are being sold in our John Bead Outlet. This is post three in our series. Here is a closer look at just one of the six models he styled. The unique embroidered dresses were hand picked by Fernando in Brazil in January. 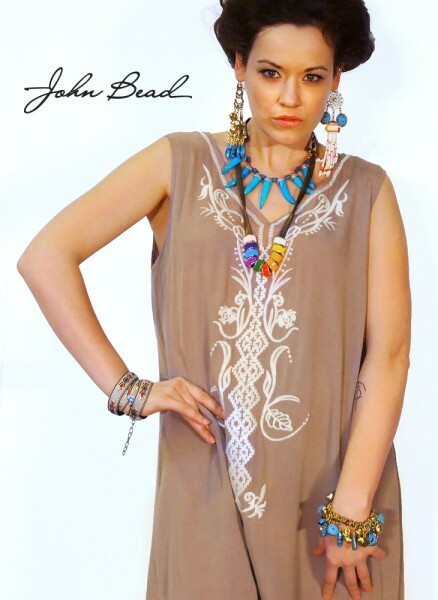 Wild boho is modeled by India Farr. She has on so many spectacular pieces that it will take a moment of looking to see everything. 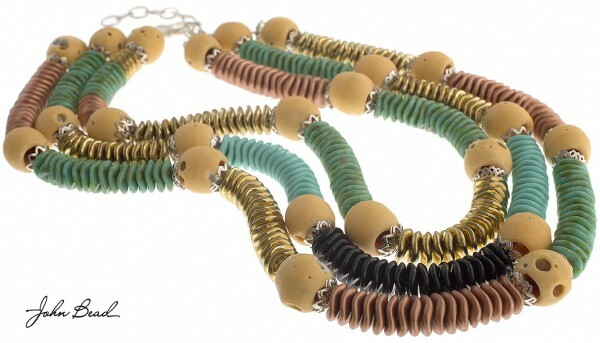 First, we hope you noticed the longer necklace with these peyote stitched channel beads from Lena Gillespie. 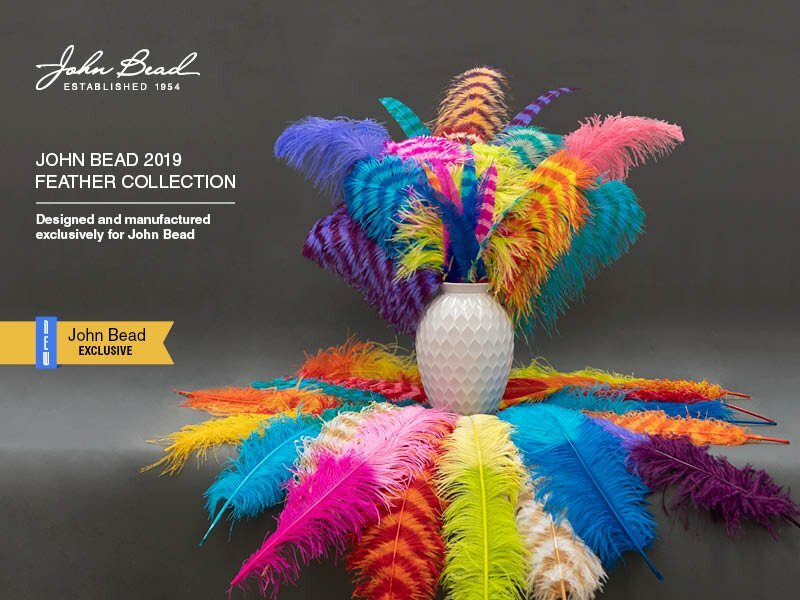 Fernando selected a gradation of rainbow beads from our John Bead catalog and Lena crafted the beads using the Global Chic channel bead blanks. The snake chain these beads are strung on is vintage and a special addition to the collection. The statement necklace Fernando designed for this look is a showstopper. 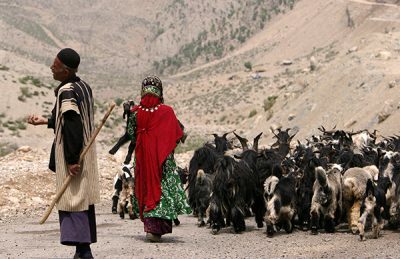 It has a wildlife western influence. 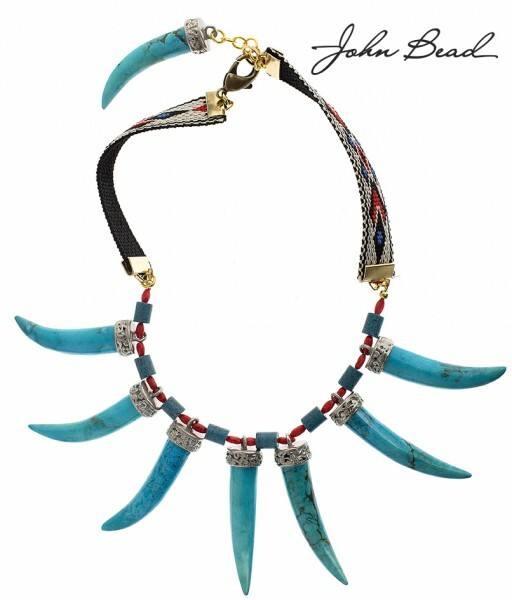 The turquoise horn pendant with the pewter caps are separated by red coral beads that put a spotlight on the red pattern in the woven hitched braid used as a necklace extension. Fernando also referred to this look as our “gypsy nomad.” There are many cultural references scattered throughout the designs. He wanted to create pieces that would work well together or that could be worn one at a time. 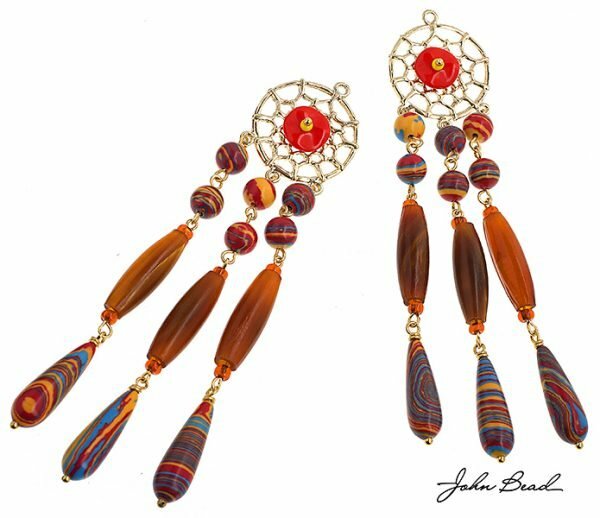 Several sets of earring were designed and ultimately the model wore two distinct one that epitomizes the boho look. 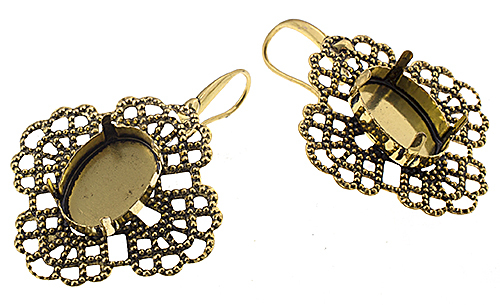 The earring on the left is exotic and features a waterfall of metal components. 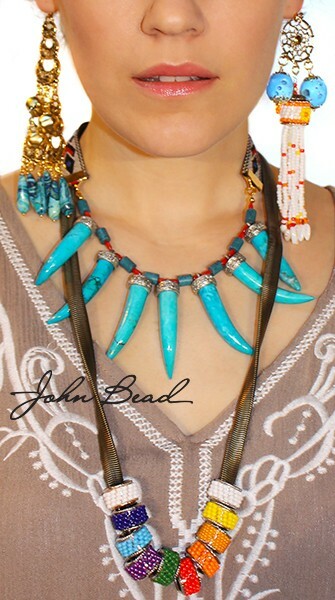 The bells add a musical element and the Turquoise/Navy Global Chic teardrop semi precious beads adds an authenticity to the look. 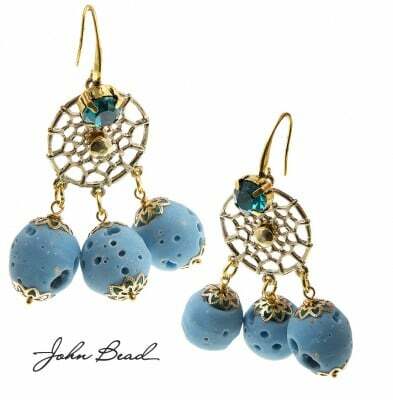 The earring on the right began with a dreamcatcher pendant and vintage Czech glass lava beads. After seeing the unique channel bead Lena Gillespie added a beaded tassels to, Fernando opted for a stunning one of a kind combination. 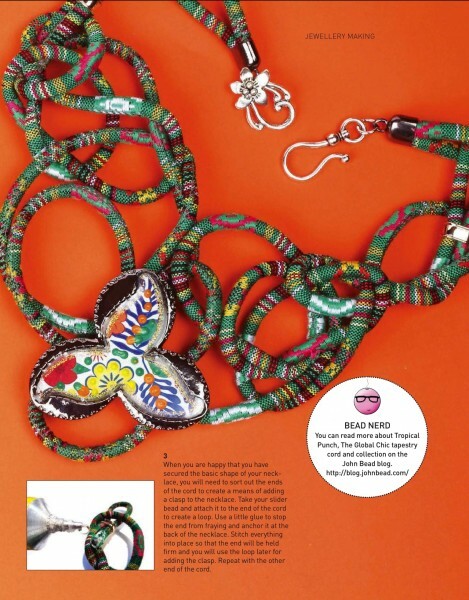 The bohemian charm bracelet featured a little bit of everything that was showcased in the earrings and necklaces. 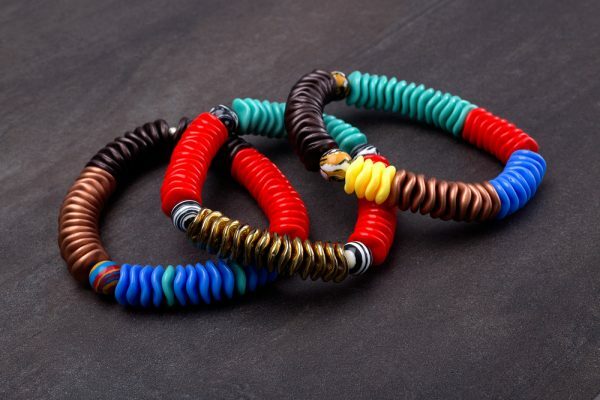 Last, but not least is the african influenced wrap bracelet. Fernando added rivets to the weave but chose to leave the patterns visible. The “Wild Boho” look was a success. This is post two in our series. Golden Butterscotch is modeled by Emily Jill Poulter. 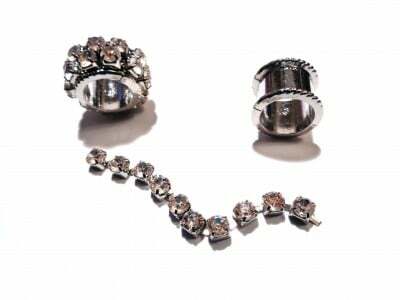 Her standout pom pom earrings, necklace, bracelets and rings all require some detailed review. The necklace was spectacular. A completely new design by Fernando taking advantage of the Preciosa Ripple (TM) beads being stacked amongst glass lava beads. 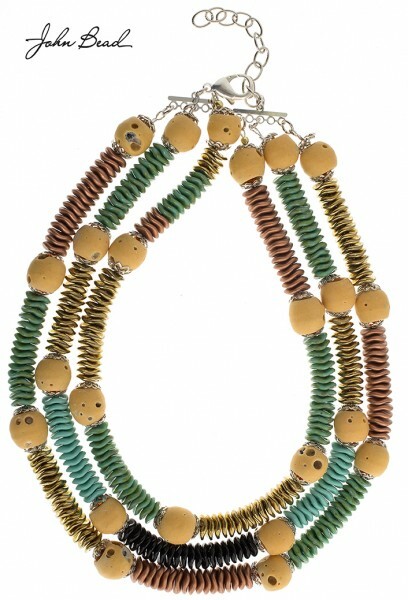 The colours in this tiered necklace are fresh and the Global Chic vibe is beautifully illustrated. Emily’s wrists were well adorned. One hand modeled a signature Fernando tapestry cord wrap bracelet highlighting black, white, ivory and gold. A color palette we think is Très Chic! 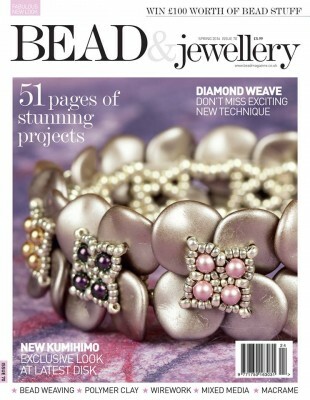 Our Global Chic channel beads are showcasing seed beads in colours to match. 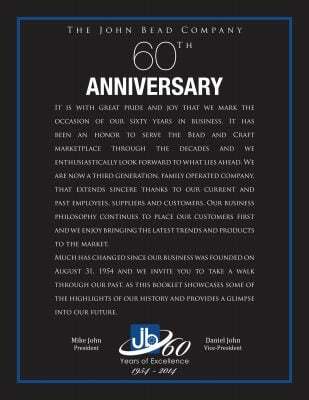 Her rings were already handcrafted and are being sold in our John Bead Outlet. The wrap bracelet was paired with this TO DIE FOR beaded cuff. 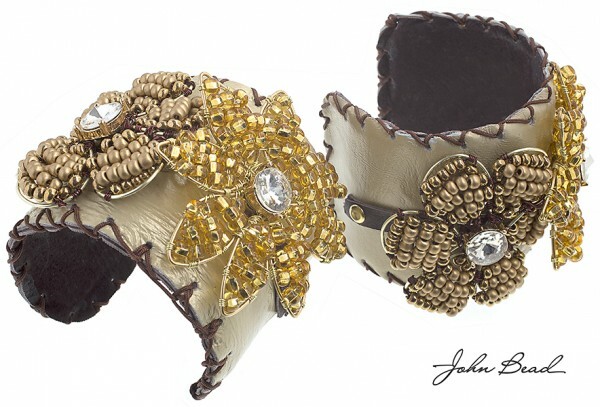 The cuff is a collaborative effort between Lena Gillespie of Purple Lace Designs and Fernando. It is the perfect example of what happens when one designer takes a look at another designer’s project. Originally, Lena had created a very large wire and beaded leaf shape for a different project with Fernando. Fernando saw the cuff in the shape and added bells and tassels to close the cuff. A wonderful result! We’ll continue featuring our runway looks throughout the Spring. 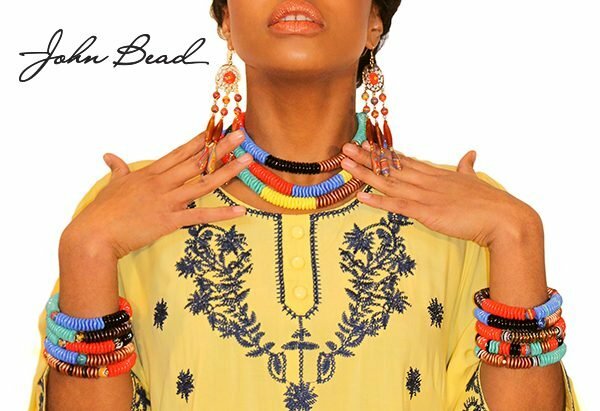 The desire to explore distant lands and to experience cultural diversity is the inspiration for the new DIY jewelry making line from John Bead called Global Chic. 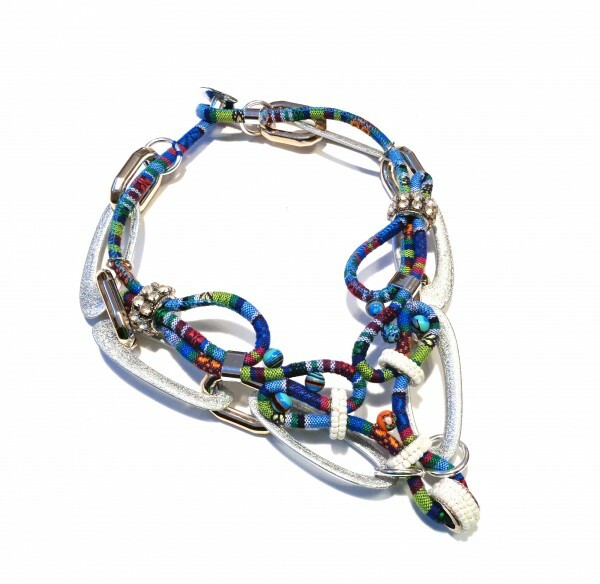 This twisted and curved necklace was inspired by several of the unique items in the collection. 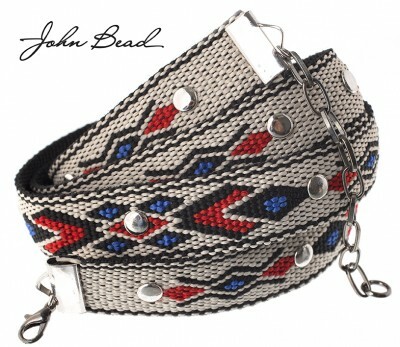 The necklace features; tapestry cord, channel beads, geometric chain and an unusual clasp feature. 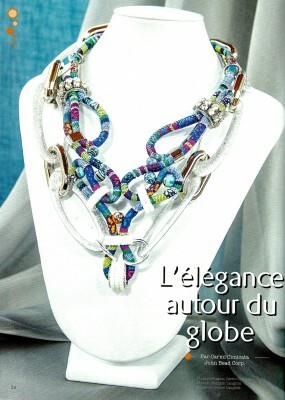 The step by step instructions appeared in french in the current issue of Perles et cetera. This is the english translation. 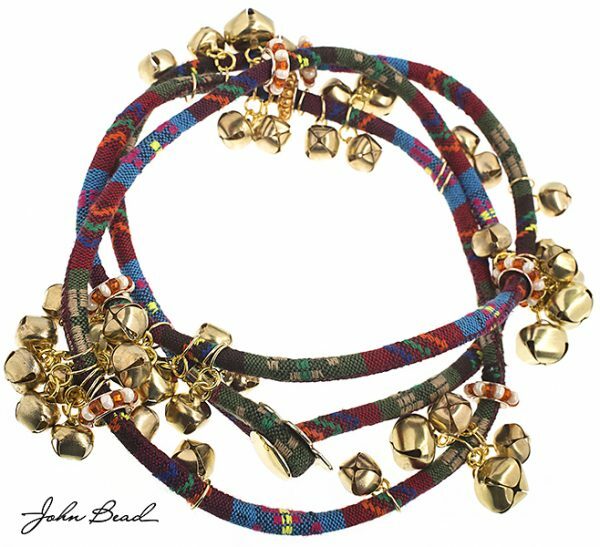 The necklace is possible due to the new Tapestry Cord in our Global Chic collection. 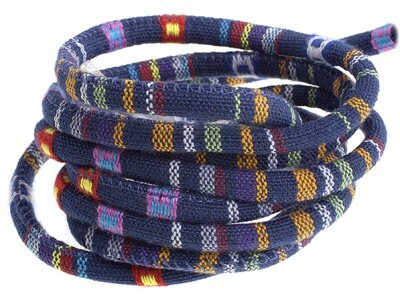 Colorful woven cotton threads wrapped around a cotton core are the main highlight of the Global Chic collection. It is incredibly flexible and can manipulated into many pleasing shapes. 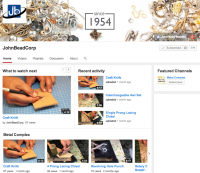 Channel beads are ideal for the savvy jewelry maker who wants to make one-of-kind components. These metallic beads are used as charms to create an extra design element to your tapestry cord designs. 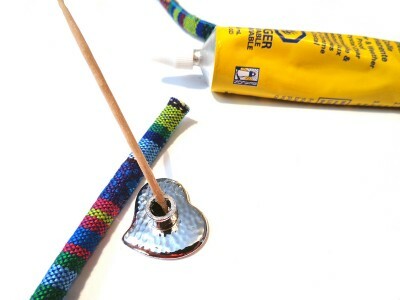 The holes are extra large to allow tapestry cord to pass through. 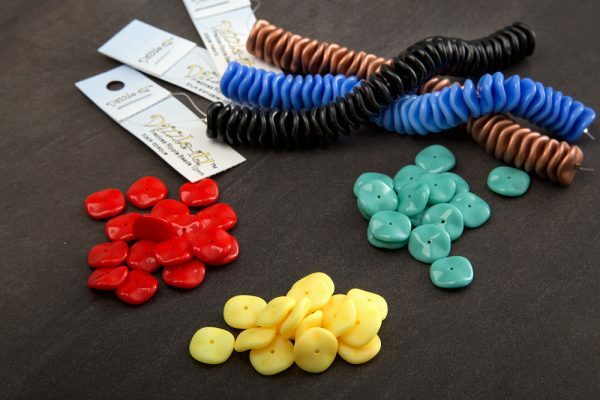 The collection contains a nice assortment of sizes so you can work with a big or small channel bead. 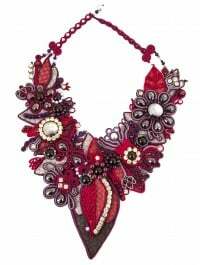 The open channel area around the beads can be embellished with seed beads and all types of stringing material such as: hemp, leather, faux suede, rattail or threads. For my project I strung seed beads on elastic and then placed them on the channel bead. A little glue was applied to ensure these would stay in place. 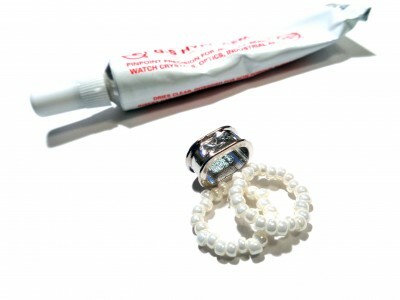 I also applied some rhinestone chain to my larger channel beads with glue. I always like to add a little sparkle to anything I create. Creating the necklace was very simple. 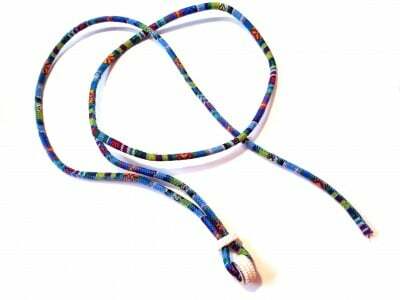 I started by placing two channel beads on the cord (as shown in the picture) so that I was working in the middle of my tapestry cord. 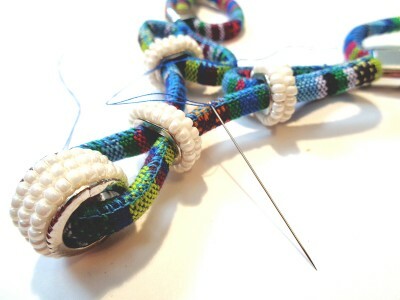 Then I continued to twist my cord into pleasing shapes using my channel beads to hold the cord in place. Pins were also very helpful to create curves that were equal on both sides. I reinforced these curves with a few extra stitches. 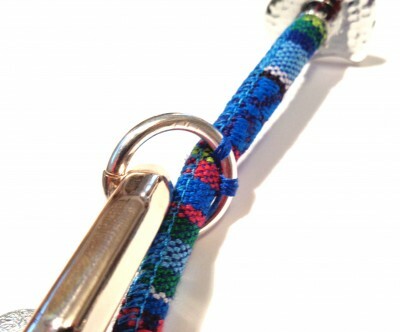 It is very easy to sew through the tapestry cord. Several more curves later I choose to stop so that my necklace would be slightly longer than a traditional collar piece. I added my unique clasp when the length was correct. These button shapes also work well with the sliders in the Global Chic collection. I glued the cord into the clasp on one side. On the other side, I folded my cord and used a slider to hold the shape. Glue was strategically placed to keep the slider in place and the one exposed tapestry cord end from unraveling. 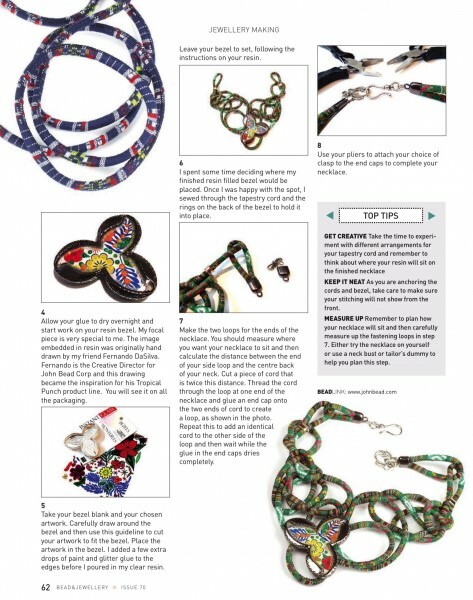 The next part was super easy because Global Chic already has unique geometric chain to choose from. 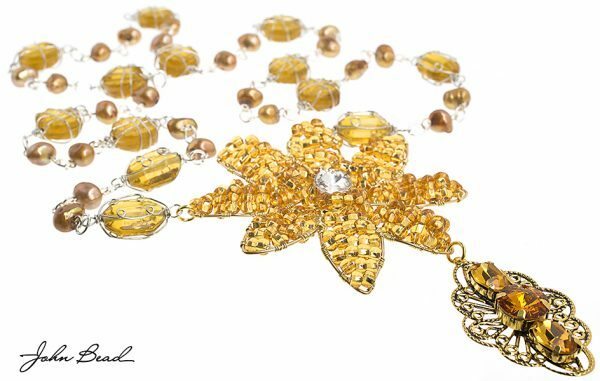 The chains are made of acrylic, which allows for a bold and extravagant design, but it is also lightweight. I divided this piece into two. A few jump rings attached to my tapestry cord created my frame of brushed silver and metal. I had to make sure the chain would not interfere with the clasp, so on one side I sewed the jump ring in place. I also added an extra jump ring at the halfway point so it would keep the chain and cord together throughout. 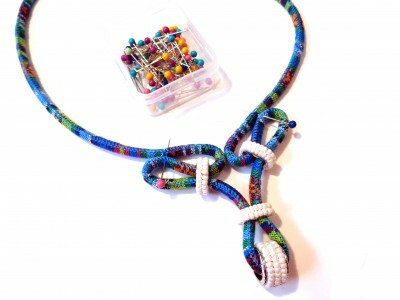 My last step was to sew some of the Global Chic multicolored beads to my necklace. These beads resemble abstract art works. They are made of genuine reconstructed stones. My finished piece, when worn, has a 3D effect. The cord is slightly higher than the chain and one cannot help but reach out to touch it to see what it is made from. I do hope you love it as much as I do. Thank you Perles et Cetera for presenting this necklace so beautifully.